August 24, 2015 - Advanced Basement Systems was awarded the top Canadian dealer in the Basement Systems Inc. network. April 18, 2014 - Advanced Basement Systems now offers three new services to help increase home efficiency and to fix settled or sinking concrete. Learn more about their new offerings! April 11, 2014 - Advanced Basement Systems has served the Greater Chatham-Kent area since 2003, and has been recently honored for their entrepreneurship and commitment to outstanding service and satisfaction by the local Chamber of Commerce. September 6, 2013 - Advanced Basement Systems received an award at the 2013 Team Basement Systems Convention held in Connecticut. October 17, 2012 - Advanced Basement Systems has recently been awarded at the Team Basement Systems International Convention. 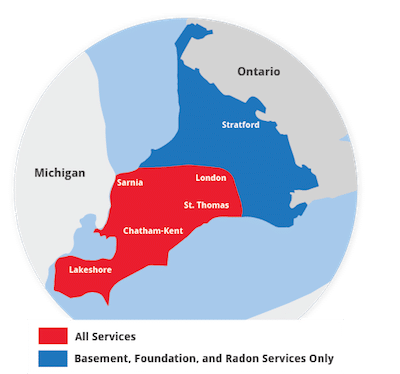 October 17, 2012 - Advanced Basement Systems has been testing homes for Radon across Southwestern Ontario and have found a startling trend in Amherstburg.